While the ads for many fat burners tell you just that, thermogenesis is not the #1 determinant of whether you're lean or fat. It is just one of a bazillion factors that influence your energy balance which in turn controls your weight. Thermogenesis is (falsely) treated like the holy grail in fat loss supplement ads. When all is said and done, though, even a 100% increase in thermogenesis, which has nothing to do with a 100% increase in total energy expenditure, is usually easily compensated for by increased energy intakes in the average and extraordinary male or female dieter. Against that background you may be asking yourselves why the latest study from the School of Life Sciences at the University of Nottingham even made the "SuppVersity newsworthy"-cut. Well, the answer can be seen in Figure 1, which tells you that modulating the eating patterns in said randomized crossover trial didn't just affect the extent of postprandial thermogenesis, but also the weight, body fat and, in particular, the 'waist trajectory' of the subjects, 9 obese women (mean ± SD BMI: 33·3 ± 3·1 kg/m²). Grazin' Bad For the Obese! In that, it is important to note that "[i]n the two intervention periods, identical foods were provided in amounts designed to keep body weight stable" (Alhussain. 2016). For the testing sessions, the participants attended the laboratory after an overnight fast pre and post each intervention period. "On arrival, measurements were made of body weight, body composition, waist circumference and waist to hip ratio. Resting energy expenditure was then assessed by using indirect calorimetry, fasted and during the 3 h period after consumption of a milkshake, test drink (50 % CHO, 15 % protein and 35 % fat of energy content)" (Alhussain. 2016). As already hinted at, the scientists observed significant changes in the postprandial thermogenic response and non-significant effects on the subjects body composition. 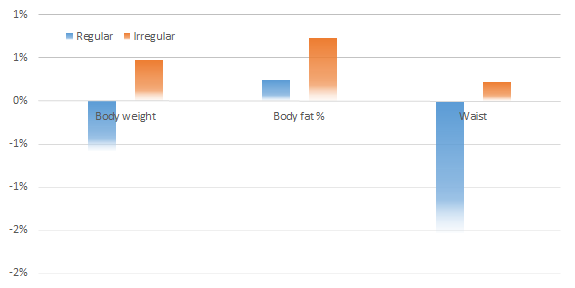 Figure 1: Changes in markers of body composition during the two 2-week periods (Alhussain. 2016). More specifically, the regular meal pattern that allowed for weight and body fat stability and even triggered a non-significant decrease in waist circumference. The irregular pattern, on the other hand, produced an albeit statistically non-significant increase in body weight and body fat - a change, of which we can hypothesize that it would reach statistical significance in the weeks to come. A 2004 study in lean women shows: This is not a "fat-girl thing". TEF of lean women suffers even more (Farshchi. 2004). This is not a "fat girl-thing"! In case you think 'Well, that's not me, I am lean and for me these results are irrelevant', you may want to take a look at a 2004 study by Farshchi et al. in which the researchers observed a similar effect in perfectly lean women. If you take a look at the figure on the left, I've copied right from the full text of said study, you will even notice that the decline in energy expenditure in the lean women is significantly more pronounced than in the obese women in the study at hand. In view of the lack of strict dietary control outside of a metabolic ward, it is hard to say whether the effects on body composition (Figure 1) were triggered solely by the decrease in thermogenesis (Figure 2) due to the irregular meal pattern. As I've pointed out in countless previous SuppVersity articles these effects may just as well be caused by increases in food intake, which are never (or at least rarely ;-) 100% accurately reported by subjects of clinical trials. Figure 2: Postprandial extra energy expenditure due to thermogenesis (kcal/3h) before and after 2-weeks on regular or irregular meal pattern in 9 obese women [mean ± SD BMI: 33·3 ± 3·1 kg/m² | Alhussain. 2016). Eventually, the lack of dietary control must not necessarily be a disadvantage. After all, there's no strict dietary control in the real world, either. Therefore, any study that tightly controls their subjects food intake will fail to portray a correct picture of its subjects real lives - lives in which the average subject shows a very low adherence to his/her (self-)prescribed diet and will thus (just as it may have been the case in this study) simply eat, when he/she is hungry, even if his/her meal plan tells him/her not to do so - and regular meal patterns certainly help avoiding hunger pangs. Previous research clearly indicates that it would be a "fat mistake" to believe that a reduced meal frequency on some of the 14 days on the irregular pattern was behind the non-sign. weight and fat gain in this study. Bottom line: It should be obvious that it would be a mistake to consider the study at hand "convincing evidence" that irregular meal patterns promote weight and, more importantly, fat gain. An effect on thermogenesis, on the other hand, appears to exist - at least in women. In spite of the paucity of evidence, the way many people in today's society are "always on the run" and hardly able (or willing) to stick to regular meal patterns, it does seem at least "likely" that irregular meal patterns are part of the reason our hectic life-styles lead to ever-increasing obesity rates. How important the impact of regular meal-patterns on our thermogenic response to meals actually is, though, will have to be evaluated in future studies | Comment! Addendum: No, this is not your average meal timing article. I am not saying you have to eat at a specific time, or you have to eat 6, 3 or 5 meals a day. The one and only thing the study suggests (and this is in line with previous studies on skipping breakfast) that you should eat at the same time (roughly) everyday. The mechanism behind the benefits is probably related to the ability of timed meals to entrain a stable circadian rhythm and optimize the way your body handles the food you consume (e.g. stable insulin and glucose levels => no release of glucocorticoids, etc.). Alhussain, et al. "Deleterious effects of irregular meal pattern on dietary thermogenesis in obese women." Proceedings of the Nutrition Society 75 (2016): OCE1, E6. Farshchi, H. R., M. A. Taylor, and I. A. Macdonald. "Decreased thermic effect of food after an irregular compared with a regular meal pattern in healthy lean women." International journal of obesity 28.5 (2004): 653-660.